SSC CGL Recruitment 2018 | The Staff Selection Commission has postponed the notification release date for the Combined Graduate Level Examination 2018. SSC CGL Notification for this year is expected to be released on 5th May 2018. 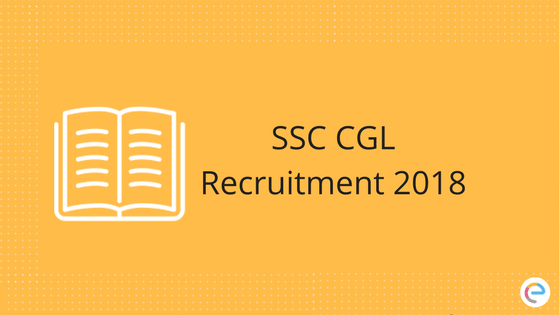 SSC CGL Recruitment Notification for 2018 is anticipated by all. Now, Staff Selection Commission has announced the SSC Calendar for the new dates for SSC CGL 2018. SSC CGL is considered to be one of the major examinations to be conducted for graduate students. SSC CGL Application Form will soon be out on the official website of SSC. As per the latest update, SSC CGL 2018 Tier-1 Exam will be conducted from 25th July to 20th August 2018. Aspirants should start preparing immediately. In this article, we have provided all the information regarding SSC CGL Recruitment such as Education Qualification, Age limit, Syllabus, Exam pattern, important dates etc. Staff Selection Commission has introduced some changes in the Eligibility Criteria for certain posts in terms of Age Relaxation and categories of Persons with Disabilities for SSC CGL 2018. However, the other terms and conditions in the Official Notification will remain same. As per the latest news SSC CGL 2018, the number of vacancies is approximately 9000, bifurcation of the same will be declared thereafter. The complete list of regions along with the respective vacancies will be updated after releasing official SSC CGL recruitment notification. From January 2018, Dearness Allowance @7% is applicable to Central Government employees in 7th CPC. After 7th pay commission, there will be a hike in salary structure for SSC posts. SSC CGL salary structure is being divided into various groups and grade pay. Group B Pay Scale and Group C Pay Scale are given below. Candidate must be an Indian citizen/a subject of Bhutan or Nepal. The candidate age should be in between 18 to 30 years old as on 1st of August 2018. The online registration for SSC CGL 2018 exam will start on 10th May 2018 and the last date to apply online is 10th June 2018. Aspirants can apply online by visiting the official website of www.ssconline.nic.in. Applications fee should be paid only through SBI either in the form of challan or through SBI Net Banking or any other bank Credit/Debit Card. Fee Challan form will be generated online. There are 4 sections in the Tier 1 exam of SSC Combined Graduate Level Examination 2018, with 100 questions which account for a total of 200 marks. SSC CGL Tier 1 & Tier 2 exam will be conducted in online mode. There are 4 sections in the Tier 2 exam of SSC CGL , with 100 questions which account for a total of 200 marks. Tier 3 is a descriptive exam and is conducted offline. Candidates need to write Essay/Letter/Application/ Precis. The Tier 4 of SSC CGL Exam 2018 comprises DEST/CPT these are required for certain government posts. The four tires are indicated below. Previous Years SSC CGL Cut Off Score (Out of 200) for Tier I are listed below. Admit card will be downloaded from the official website of conducting authority i.e. ssc.nic.in. Every candidate who registered for SSC CGL Exam within the stipulated time will be assigned an e-admit card/hall ticket. To download the admit card, visit the website and enter their registration number/date of birth in given fields in order. SSC CGL Admit Card will have details of the examination such as Date of Examination, Roll Number, Code of Centre, Examination centre, Photograph, and Signature. It is significant to bring the Admit Card in the Examination hall, without which candidates will not be allowed to enter the hall. We hope this detailed article on SSC CGL Recruitment helps you in your preparation. If you have any query regarding SSC CGL Recruitment or the exam in general, drop a comment below and we will get back to you. This is entirely up to you, Jesinth. Read the eligibility criteria and the job profiles for each position and decide yourself.